There are multiple ways to select an Instrument in the Level II window. •Right clicking on the Level II window and selecting the menu Instruments. •With the Level II window selected begin typing the instrument symbol directly on the keyboard. Typing will trigger the Overlay Instrument Selector. The Summary section displays total size per price level. You can change the graph type via the Level II properties dialog window. 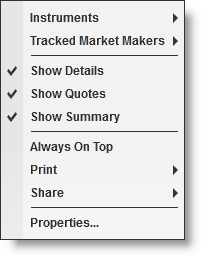 You can disable the Summary section by clicking on your right mouse button and selecting the menu Show Summary. The Details section displays bid data on the left and ask data on the right. You can disable the Details section by clicking on your right mouse button and de-selecting the menu item Show Details. Right mouse click on the Level II window to access the right click menu. 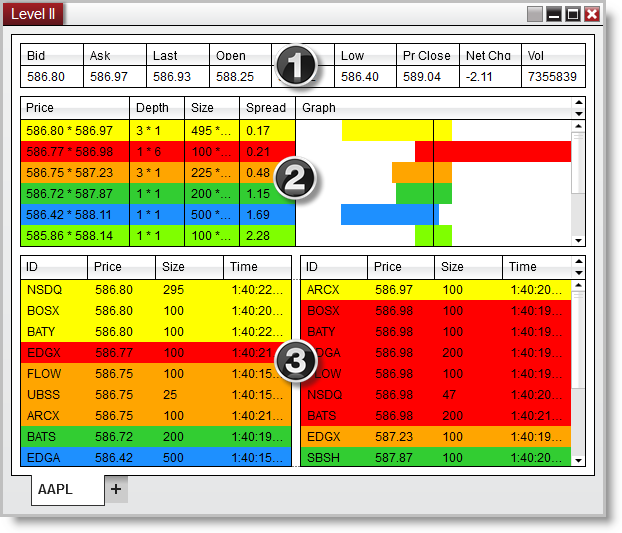 The Level II window is a tabbed interface, this gives you the ability to have multiple Level II tabs configured in the same window. Please see the Using Tabs section of the help guide for more information.